Savannah high tea is searved each afternoon in the tradition of gracious southern hospitality for guests who stay at our bed and breakfast, which is located in the heart of downtown Savannah, Georgia. High Tea means different things to different people. The origins of Afternoon Tea show clearly this was the preserve of the rich in the 19th century. Savannah High tea was never intended to replace dinner but rather to fill in the long gap between lunch and dinner at a time when dinner was served at 8 pm. Lifestyles have changed since those times and afternoon tea is now a treat, rather than a stop-gap. It’s nice to return to the Inn after a long day of drinking in Savannah and enjoy the treats and beverages prepared fresh on the premises each day. Afternoon high tea is served daily, from 3:00 p.m. – 5:00 p.m.
After a busy day of sightseeing, vacation activities, or business meetings, afternoon tea can be delightful! In addition to tea (which we serve iced and hot depending on the time of year), we also offer a variety of delectable sweets and savory treats. 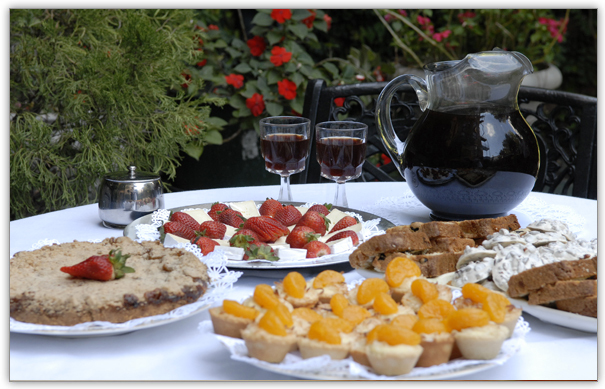 You can your can enjoy your afternoon Savannah high tea in one of our large parlors or in our beautiful courtyards and gardens. Please note: Afternoon Savannah high tea is included at no extra charge with our bed and breakfast rooms, as is breakfast and wine and hors d’oeuvres.